Let me be clear, though there is a history of association, there is no actual association with the devil. 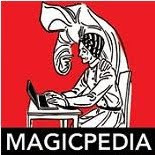 Magicians are not devil worshipers, nor do they conjure up demons in order to present their effects. A number of conjurers over the years have implied this link in order to make their effects more mysterious, but it just simply is not so. Magicians and conjurers of the 1500-1700s were mostly street & outdoor faire performers. Their use of advertising would have been limited, due to the lack of technology mainly. Whatever early pamplets or fliers there might have been would have had only words and no graphics or very primitive graphics. 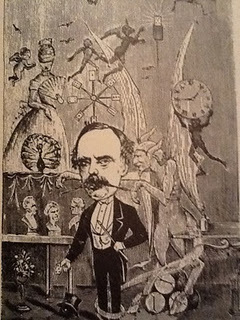 But that changed in the 1800s and the use of playbills and posters would eventually be the primary source of advertising a magicians performance right up into the early 20th Century. By the 1840s, European magicians began using devil creatures in their advertising in limited amounts. The 1848 poster advertising Robert Houdin's performances at the St. James Theater in London even has a few imp creatures on the poster. Though I couldn't find anything like that on his French advertising material. In America, Robert Heller made more blatant use of the demonic imagery. His early posters were primitive and usually in a single color, but towards the end of his career he began to use two color playbills and posters with the devils appearance becoming more prominent. At one point in his career he adopted the slogan "Go To HELLers!" and would have print up flyers with this headline and information about the show. Some of these flyers were specifically sent to local churches. 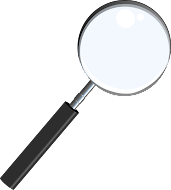 The clergymen would attend the programs to see what was going on and often return to tell their congregations about the wonderful entertainment they had seen. I can't help but imagine this scheme had to backfire a time or two, but it was a bold ploy and it worked for Robert Heller. 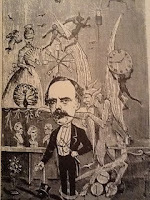 At the same time Robert Heller was performing in the United States, John Henry Anderson too arrived with a show that was very similar, both men had copied Robert Houdin's act. John Henry Anderson, who went by the moniker The Great Wizard of the North, may have used demonic imagery at some point. But interestingly, I saw a poster of Anderson's that used the opposite approach, rather than have devils and demons, he had a poster with the border covered in angelic beings. 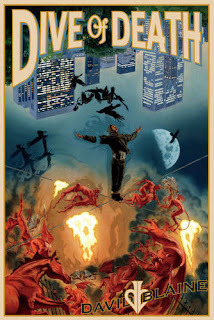 In his Second Site poster an angelic being can be seen hovering behind the performers. 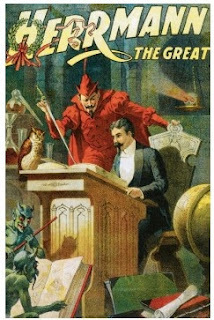 The explosion of devilish advertisments took place when magicians moved from using simple printed playbills to elaborate full color lithographs. The lithographic process dates back to 1796 but the use of color in lithographs wouldn't begin until 1819 and even then wasn't quite perfected until the 1840s. The two most prominent performers to use full color lithographs and devilish imagery were Alexander Herrmann and Harry Kellar. Which one of them used the devil images first is open to debate. My guess would be Herrmann, afterall he looked just like the Victorian eras depiction of Mephistopheles himself. The suave devil with small horns, mustache and goatee and a pitchfork is an invention from this time period. No such description of the devil exists in any biblical texts, so where the origin of this image actually comes from I've not been able to uncover. 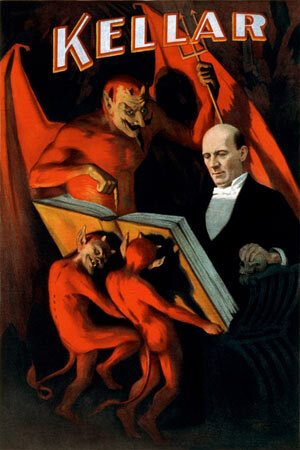 Harry Kellar's first use of a devil on his posters was in 1884. Two devilish figures appear on a poster for his Spirit Cabinet, this can be seen on page 242 of Kellars Wonders by Mike Caveney and Bill Miesel. It wasn't until 1894 that Kellar really begins to commit to this design idea. His iconic poster (right) with the whispering imps is probably the most copied posters in the annals of magic. 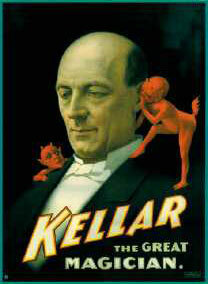 When Howard Thurston purchased the Kellar show and became Kellar's successor he continued using the imps and the devils in his posters throughout his career. And not to be left out, Carter, Raymond, Dante and Blackstone all used devils in their posters. Even Houdini was not immune to the effects, though it looks as if he only used the devils once and that was in his poster promoting his Prison Cell & Barrel Mystery. After the Golden Age of Magic the use of the devilish figures diminished though they have not vanished entirely. A few years ago, Ricky Jay used a version of the whispering imps poster to promote his Ricky Jay and his 52 Assistants show. 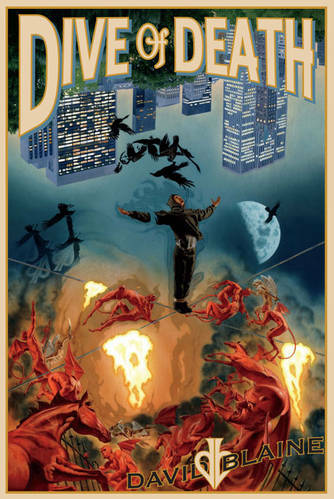 More recently, David Blaine has included the use of devils or what is really now iconic magic imagery in some of his posters. The second Kellar poster is brilliant - love it. It's interesting that some people still have to be disabused of the notion of magic being the devil's work. Then again, given some of the stuff people choose to believe against all reason it shouldn't really surprise me.